At NV Hair and Beauty we offer special occasion packages. We pride ourselves on providing a first class service for all of our clients. We have a comprehensive choice of packages to suit your needs. Call our salon in Worcester today on 01905 767555 and speak to one of our Stylists or Beauticians to arrange a free consultation. 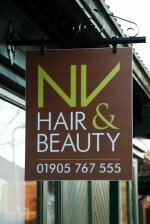 NV Hair and Beauty offer Wedding, Prom and Special Occasion Hair in our Worcester salon. You can choose to have your hair put up or a style created to suit your requirements. It may be that you are at a loss for ideas; this is where our stylists can help suggest a style to suit your occasion or outfit. It is a good idea to photograph your outfit so that when you come in for your consultation our stylist can suggest a complementary style. These special occasions can take a lot of planning and preparation. To help, we offer trials so that you will know exactly how you will look on your big day, be it a wedding, prom or a special occasion! You may choose to have your services done in our salon in Worcester or we can even provide our services at your chosen venue. Prices for hair up services vary, depending on length of hair. Trials incur an additional charge, unless otherwise stated. A 50% deposit is required to secure your date. Deposits are non‑refundable and non‑transferrable. All prices are subject to change without notice. Call 01905 767555 today and book your FREE consultation.